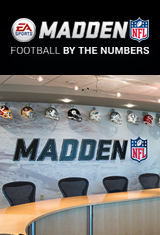 EA SPORTS: Football by the Numbers is an engaging middle school educational program designed to harness studentsâ€™ love for football to engage them in key math and science concepts. Challenge students to solve real, on-the-field challenges with the dynamic digital interactive, and introduce them to the S.T.E.A.M. behind the worldâ€™s coolest games with our on-demand virtual field trip to EA SPORTS!